This is just a stock image to make this look more pleasing. 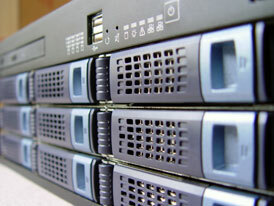 We recently just cut a check, (WE'VE CUT A BIG CHECK) and bought a bunch of new servers. Of course we did not want to settle for cheap sh*t but did not want to buy Dell or Compaq either. Making the long story short(er) we got nice machines, all at least dual CPU if not multy core. It's a combination of Intel and AMD platforms from Intel Dual core 1U machines with 4Gb of ram and of course raid SATA drives to Dual core - dual CPU AMD Opterones 64bit units with 8Gb ram and about 6 SATA drives. ALL hot swap, yay! This is good stuff, we're going to make everything as redundant as possible so that there are no more outages. Of course, who believes that 99.999% uptime on a $9/mo hosting plan is a bunch of bull. We couldn't guarantee you that even if you paid $50/mo. It's just not going to happen because hardware fails and for you to have a redundant website for just a few bucks a month is just not worth it. I would rather be honest to all of our customers and tell you upfront when we are scheduling a server move or upgrades or if your machine fails, you'll find out about it right here! So remember, check back on this blog to find out server status and issues as they arise.